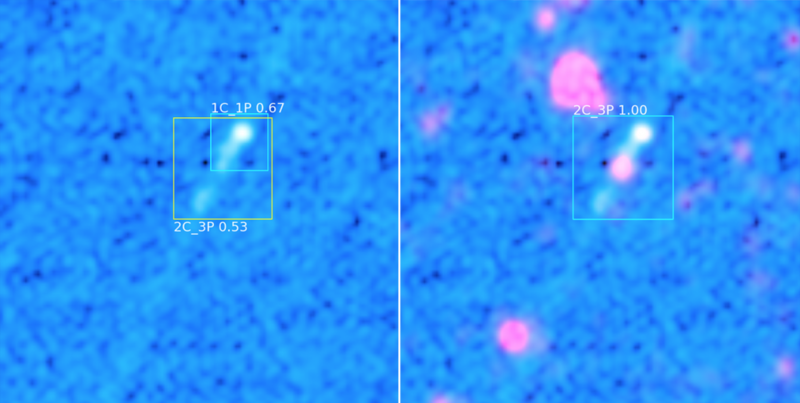 Fourteen radio galaxy predictions ClaRAN made during its scan of radio and infrared data. All predictions were made with a high ‘confidence’ level, shown as the number above the detection box. A confidence of 1.00 indicates ClaRAN is extremely confident both that the source detected is a radio galaxy jet system and that it has classified it correctly. ClaRAN looks at over 500 different views of radio galaxy data to make its detections and classifications. After scanning through the different views, ClaRAN then also considers the data from infrared telescopes to refine its predictions, giving the final detection and classification result of a radio galaxy jet system. To the left is a radio galaxy jet system detected by ClaRAN using only data from radio telescopes. ClaRAN isn’t sure what it’s seeing here, giving two predictions, one covering the entire system with a low confidence of 0.53, and one covering the top jet only with a confidence of 0.67. To the right is the same galaxy, but with infrared telescope data overlaid. With the inclusion of data from infrared telescopes ClaRAN’s confidence in the detection has increased to the highest value of 1.0, and ClaRAN now includes the entire system in its only prediction. 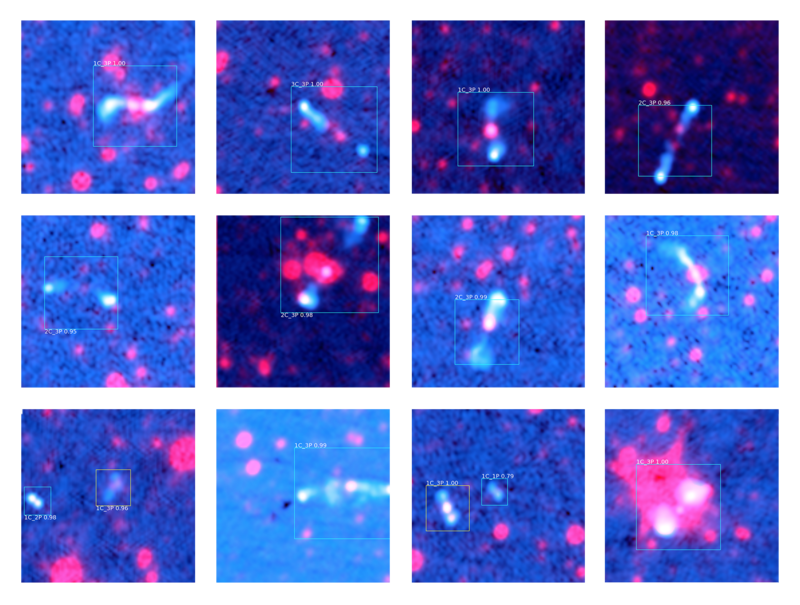 Citation: Radio Galaxy Zoo: Claran – a deep learning classifier for radio morphologies.